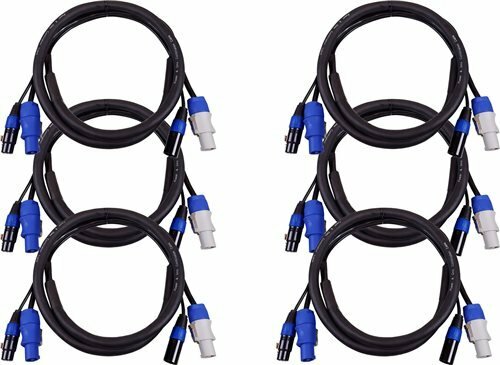 Blizzard 6Ft PowerCon 3-Pin DMX Combo Cable 6 Pack - Cool Cable DMX cables comply with EIA-485 standards for superior performance in DMX applications. - Blizzard uses high-quality 3-pin XLR(M) - XLR(F) connectors with integral strain relief, ultra-flexible 22-gauge custom-manufactured cable, and they come with a lifetime warranty against defects. Cool Cable DMX cables are color-coded as well for easy identification of DMX versus standard microphone lines. - Blizzard DMX cables also come with convenient velcro cable wraps to keep everything neat and tidy! If you have any questions about this product by BLIZZARD LIGHTING, contact us by completing and submitting the form below. If you are looking for a specif part number, please include it with your message.